You voted in our Merry Madness bracket - and now we have a winner! Picture this: It’s a cold evening in December. You’re in your most festive pajamas, curled up under a fuzzy blanket on the couch or in your favorite chair. Snow is falling outside, blanketing the world in white and a fire is crackling in the fireplace. You have your hot chocolate in one hand and the remote in the other, ready to celebrate the holiday season with a festive film. Our question is this: Which movie is the best choice to get you in the Christmas spirit? 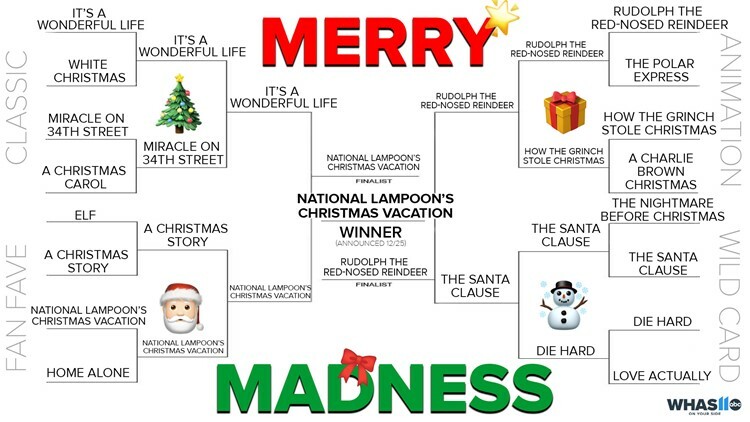 We decided to go with a tried-and-true method to see which movie is the ultimate Christmas favorite – a “Merry Madness” bracket! We split the films into four categories: Classics, Fan Favorites, Animation, and Wild Cards. After 15 rounds and nearly 5,000 votes, you have decided! Thanks for playing and we'll see you next year!